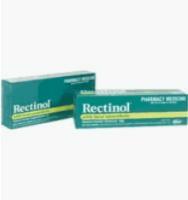 Rectinol ointment is manufactured by Pfizer Pharmaceuticals. It is available in very few pharmacies. As you can see from the formula above. The fact that it contains a protectant and a local anesthetic makes this a good formula to help with getting rid of simple cases of hemorrhoids. While the anesthetic helps in keeping the pain under control, the hemorrhoids are protected from further irritation, and thus healing takes place. For this product to work for you, it will depend on what type of hemorrhoids you have and also at what stage these hemorrhoids actually are at. If you are not sure, take a look at all the other creams on the other pages. Read to see what strength they are, to know which is the best one for your type of hemorrhoids. If you are still confused, then fill in the form and send me an email for more help, or alternatively read my E Book for the full cures.